Dinosaur Jr. have been putting out amazing music ever since the original trio of J Mascis, Murph and Lou Barlow got back together in 2005. Four albums have risen from the reunion, with Give a Glimpse of What Yer Not the most recent in August 2016. The evolution of the band since 1984 has Mascis and Barlow both bringing their songwriting talents to the forefront while Murph proves he’s one of the best drummers alive on every track. 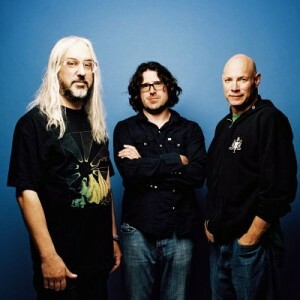 In an age where underground rock has been searching for its latest identity, Dinosaur Jr. has resurrected and reinvigorated the classic alternative sound. This trio will be taking the stage at The Met in Pawtucket on Sep 27 for what should be a killer time with Detroit’s Easy Action opening things up. I had a talk with Murph ahead of the show about being in fellow Massachusetts band The Lemonheads during the ‘90s, the differences between playing with J and Evan Dando, breaking sticks and what his favorite drum kit is. Rob Duguay (Motif): Dinosaur Jr.’s latest album Give a Glimpse of What Yer Not came out a little over a year ago. J Mascis has produced nearly all of Dinosaur Jr.’s records: Is there any difference between working with J as a musician versus J as a producer, or is it all the same? Murph: It’s pretty much the same. When J is in the studio producing and engineering, Lou and I aren’t there. He does that on his own and we leave him to it. In the very early days, during the first few records, we would all try to get in the studio and put in our two cents, but nowadays we all do our separate parts and then we leave. I do the drums, and I might come back and check in once or twice, but we all kind of have our role and then we check out. It’s done in sections and the last section is mixing and producing, that’s just how it works. RD: That’s an interesting way to record. After you initially left Dinosaur Jr. in 1993, you joined up with The Lemonheads in 1995 and you were drumming with Evan Dando until 1998. Did it take any adjusting for you as a drummer at the beginning of joining that band, or did you adapt right away and it was seamless? M: It was actually really fun because when we [the Lemonheads] wrote Car Button Cloth we just did it in the studio. Evan had a rehearsal space in New York City in the West Side and we would meet up every day around dinner time and just jam, hang out and go out carousing around the city, and I would get home at three in the morning every day. That’s how we did it. Working with J is more like working with a teacher, there’s parts and you really have to do the work to learn stuff. With Evan, it was more like hanging out, partying and having a good time and see what happens. It was a totally different experience and it was really fun. RD: On songwriting alone, Evan is a lot more mellow and more melodic while J is more of the riff-heavy guitar player. M: It’s almost like when you go to the gym. Working with Dinosaur Jr. is like having a personal trainer, while working with Evan is like going with your buddy and having a good time. That’s kind of the difference. RD: One trait of your drumming that’s very evident is how loud you get with pounding beats and tight fills. There must be a bunch of wear and tear on a kit because of that. For an estimate, how many times have you broken a tom or a snare? Does it not happen that often or is it the opposite? M: Mainly I go through sticks and drum heads. The only thing I break are cymbals when they crack. After about two weeks of touring, there’s always a crack in one of the cymbals. I’ve also broken pedals a lot because those are chains and I’ve gone through those a bunch. RD: What’s your primary kit that you use these days? M: I use Tama. I’ve been using Tama for a long time because they really cut through, they’re super loud. I started on Gretsch, I love old Gretsch kits but, live, the Tama just really cuts through. Ludwigs sound great in the studio but they’re not very good live. They don’t have a lot of power to them where the Tamas seem to be like cannons. We rent gear when we do festivals in Europe and the Tamas are always really consistent. I play a Superstar Classic and I can always depend on it to be really consistent no matter where I go, which is really helpful. RD: After the show at The Met , what does the fall have in store for you, J and Lou? Is there another album in the works? M: We got one more push coming up in the States. We’re going to be doing a major tour all over the country. Then we go back to Europe for one more tour, we do some of Scandinavia and UK tour, and that brings us up to Christmas and then we’ll break. We never talk about doing a record: with Dinosaur Jr. we’ll stop and then at some point we’ll get a call from J or the manager about getting back in the studio. That’s usually how it goes, we don’t sit down and discuss a game plan. It just happens when it happens.